If you are ready to experience the concept of luxury camping during your next camping holiday, Camping Cisano / San Vito is the ideal place to get started. 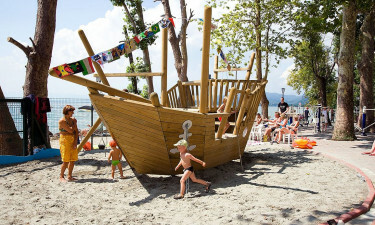 Located right on the shores of the stunning Lake Garda, this luxury campsite is equipped with all you may possibly need for a relaxing and well-deserved break. Book your luxury camping holiday in Italy with Lux-Camp and we guarantee that you won't go back to regular camping. Welcome to Camping Cisano / San Vito, a scenic holiday destination near Cisano de Bardolino. Why book a stay at Camping Cisano / San Vito? Camping Cisano / San Vito puts at your disposal a wide range of leisure and entertainment facilities that guarantee that every day will be filled with interesting and exciting things to do. Those who like to keep active during their holidays can choose between the various sports facilities available, which include a multi-sports field, tennis and table tennis courts, a minigolf course, fitness equipment, and the possibility to rent watersports equipment like canoes, wakeboards, or water skis. Please note: The pool area in Cisano is open from 26/4 until 20/9, and the pool area in San Vito is open from 1/6-7/9. 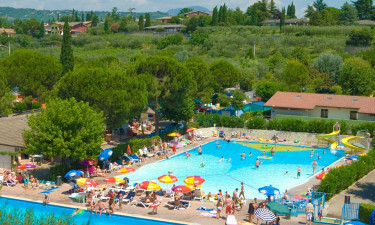 Camping Cisano / San Vito welcomes families with young children with its kid-friendly facilities. These include a toddlers' pool, water slides, a games room with video games, and two dedicated entertainment programmes: one for children aged 0 to 12 and one for teenagers aged 13 to 18. The camping's on-site restaurant and pizzeria serve favourite Italian staples and offer a take-away menu. There is also a snack bar in the premises in case you feel peckish between meals, and a fully-stocked bar serving soft and alcoholic drinks. Camping Cisano / San Vito offers an extensive selection of quality groceries, including freshly baked bread. If you need to stock up on special items, there are two large supermarkets only 500 metres away in Cisano town centre. 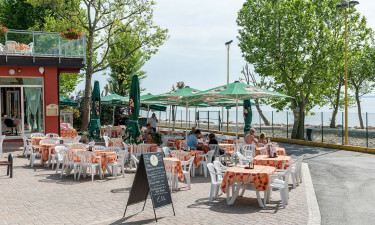 Also in Cisano you will find several ice cream parlours, cafes, boutiques, and wine shops selling local specialties that make great gifts and souvenirs. The city of Verona and its designer outlets are only half an hour away from Camping Cisano / San Vito.